High powered guns seen in the hands of criminals in Mendi last week were stolen from the PNG Defence Force. PNGDF Commander, Brigadier General Gilbert Toropo confirmed this in a press conference last Friday that many of the guns seen in the hands of locals had been identified as standard issue military firearms. He said that many of these weapons had gone “missing” from the PNGDF armoury in the 1990s during the term of former PNGDF commander Jerry Singirok and have only just resurfaced in the current unrest in the Southern Highlands and Hela. “I can say that having seen those weapons on social media, especially the Mag 5s, the M16s and the SLRs (Self-Loading Rifles), I can confirm that they are our standard PNGDF weapons,” he said. Brig-Gen Toropo said that firearms currently being held illegally by LNG landowners and other issues motivating groups in the area have been identified as a major motivators in the recent outbreaks of violence. In response, Brig-Gen Toropo said that the PNGDF will be coordinating with police to facilitate a voluntary surrender of weapons, before a joint search and seizure teams will be deployed into villages to recover illegal firearms. “We know exactly where these weapons are. We will conduct together with the police, road blocks, cordon search of houses and villages that we have known where there are firearms and we will deal with those people who keep those illegal firearms in accordance with the laws of our country,” he said. Despite a guns amnesty in 2017, the firearms buildup in the Southern Highlands has continued unabated. Meanwhile, the PNG Defence Force is into a major deployment in the restive oil rich Southern Highlands province. Altogether, it will have 440 troops on the ground in Mendi, provincial capital of Southern highlands, where trouble flared on June 15 following a high court decision to dismiss an election petition against incumbent governor William Powi. The Government has declared a State of Emergency in the provinces and mobilised police and army into the region. PNGDF Commander General Gilbert Toropo said last Friday this will be the second biggest callout since the 2017 national elections where 500 soldiers were deployed. But he cautioned his men that ‘we are not going into a war zone, we are going to our people’ and urged his soldiers to use common sense and minimal force. The State of Emergency was declared after supporters of the petitioner, angered by th court decision, torched a Dash 8 plane belong to Air Niugini subsidiary Link PNG, and burnt the court house and governors residential compound. PNGDF commander, Brigadier General Gilbert Toropo confirmed that the PNGDF will be deploying a contingent of 440 troops to the SOE area. This is about 3 companies of about 150 men each. 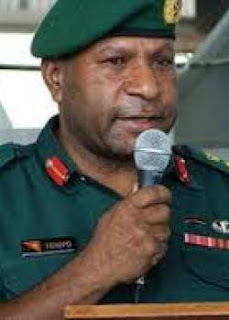 Despite the massive deployment of troops and recent incidents of conflict between national security forces and issues motivated groups (IMG’s) in the region, Commander Toropo has maintained that the PNGDF does not anticipate much resistance from IMG’s and he has instructed his troops to use only minimal force where necessary. “We understand that the incidents happening up in the southern highlands are known to be the actions of a few individuals which do not represent the majority of peace loving people. I want to make it clear that this is not a warzone. When we go into the Southern Highlands and Hela, we are not going into a warzone. We are going to our people… I am pretty sure that common sense will prevail,” said Commander Toropo. “The security forces will continue to remain in Enga, Southern Highlands and Hela provinces until peace and stability is returned and the perpetrators of these incidents in Mendi, Angore and Hides are dealt with,” he said.